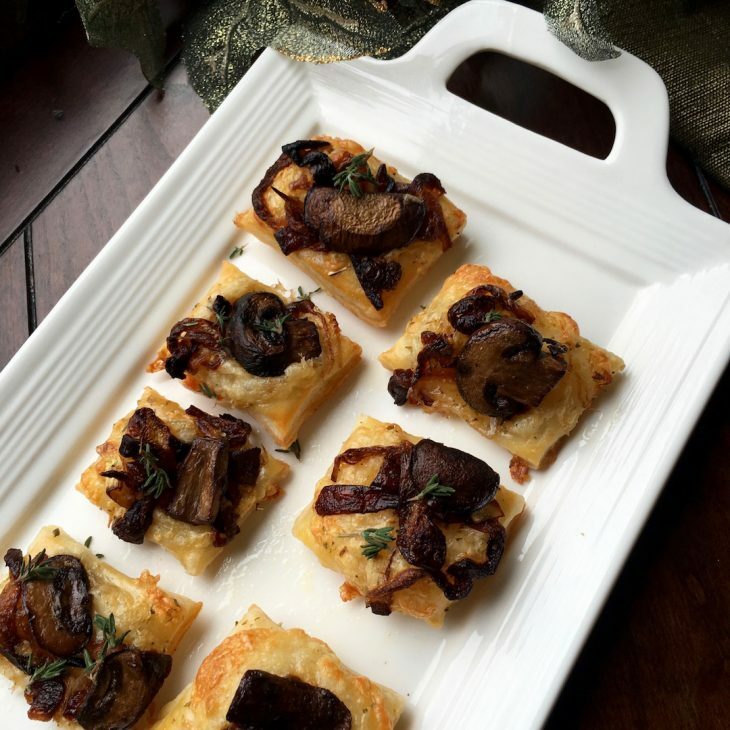 These savory puff pastry bites hit all the right notes with sweet caramelized onions, marinated Portobello mushrooms, Applewood smoked cheddar cheese, and a hint of fresh thyme. Although there are several steps required to assemble these tasty morsels, the results are well worth the effort. I typically don’t share labor-intensive recipes like this but these are so good. If you have some extra time you’ll be so glad you made these. It takes some time to caramelize the onions, so this recipe is designed to give you plenty of left overs for your efforts. What you don’t use in this recipe can be stored in an airtight container in the refrigerator for a week, or they can be frozen for later use. They are great to have on hand, because they are absolutely delicious on sandwiches, in soups, or on top of your favorite pizza. TIP: Put the cheese in the freezer for 10 minutes before grating for best results. Thaw puff pastry overnight in the refrigerator. In a medium glass bowl, combine mushrooms and Marsala wine. Season with salt and pepper, to taste. Toss to coat. Marinate for 20 minutes at room temperature. Drain excess moisture before cooking. Heat 2 T. olive oil in a large skillet over medium-high heat. Once oil is hot, add marinated mushrooms and sauté until browned and tender, approximately 5 – 7 minutes. Remove from heat and transfer to a bowl. Set aside. To caramelize onions, slice off both ends and remove the papery outer layers. Cut onion in half lengthwise (from tip to root). Then cut each half across the middle to form four sections. Cut each section lengthwise into strips. Over medium heat, melt butter in a large skillet with high sides. (For best results, do not use a non-stick pan). Add onions and stir with a wooden spoon until coated with butter. Cook onions over medium heat for approximately 45 – 50 minutes, stirring every 5 minutes or so to ensure they cook evenly and don’t stick to the pan. The exact cooking time will vary based on several factors, including the age of the onions and how many you cook at one time. Once the onions reach the desired depth of color, add white wine to deglaze the bottom of the pan. Add more liquid if necessary to scrape up all the brown bits and then salt and pepper the onions, to taste. Remove from heat and let cool in pan until ready to use. Once cool, transfer any unused onions to an airtight container for future use. Preheat oven to 375 degrees. Line two large rimmed baking sheets with parchment paper and set aside. Cut thawed puff pastry dough in half and roll out on a lightly floured surface. With a sharp knife or pizza cutter, cut the puff pastry sheet into 32 equally sized rectangles. (See picture). Transfer puff pastry pieces to a prepared baking sheet and place in the freezer for 10 minutes.